raydium_modler, RaydiumModelerEn, is a Raydium dedicated to handling file sorting. Historically, this tool was designed to create 3D models, then focus more specifically on the final integration of 3D models exported from real modeling software (see Blender). Before you'll be able to use it you must first InstallRaydium. The download is made at this address: http://raydium.cqfd-corp.org/data.php?nom_rep=bin_tools_win32, the package bearing the name: raydium_modler_win32.zip. To install it, nothing more simple, just unzip the archive into a directory. The prompt is accessible via tilde(~)/accent(`) key. Its the button located above the TAB key. You can get a list on the different possibilities of raydium_modler since the prompt by typing "/ help"
Note: Do not forget to type the "/" before entering each command into the console. It allows, as its name suggests, to leave the application. Another way is just as effective the ESC key. change the cursor position in Z. It can enable / disable the display of axes. Syntax: "/ axis [on | off]"
It can activate / deactivate wireframe rendering. Syntax: "/ wire [on | off]." It can enable / disable the display of the grid. Syntax: "/ grid [on | off]." It can enable / disable the preview in the upper left corner of the texture. Syntax: "/tex [on | off]"
It was used initially for modeling directly with raydium_modeler. But since scripts import / export are some CLAUDE 3D modelers see ImportExportTri. It is used to load a texture (TGA), possibly from the repository. 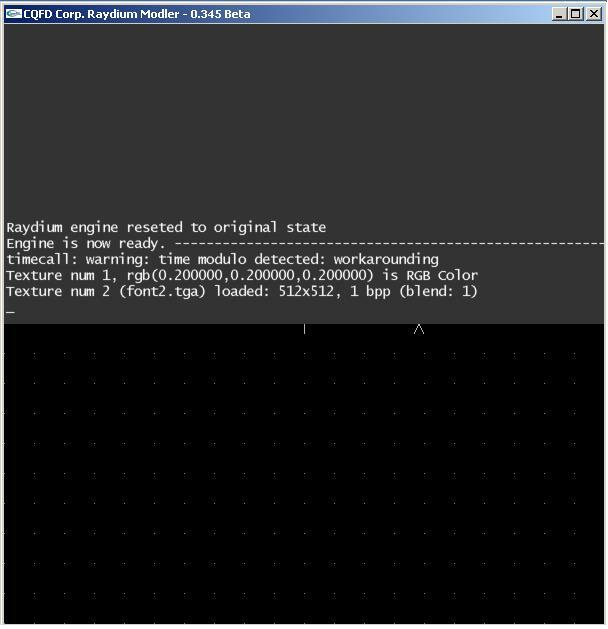 It can load a file sorting raydium_modeler. If you do not have this file on your machine, the Modeler will check its availability in the repository and download. Similarly it download all the textures associated with the file. Sorting. It can save the file locally sorting loaded in the Modeler. It can save locally and upload the file sorting loaded in the Modler the repository. But it increasingly upload the file dependencies (eg textures). Allows you to upload a file (unrestricted type) on the repository without charge. This command uploads the model currently loaded into the Modeler. Same as 'upload', but with the management of dependencies. To list the files available on the repository using filters. Similar to "save", but seeks to store the file, particularly in placing textures "transparent / translucent" at the end of the file, to optimize rendering. This method completely change the order of faces. It can move the object loaded in the Modeler. If the command is used without arguments, it uses the cursor (mouse + z). It can rotate the object loaded in the Modler a given angle in relation to a given axis. Syntax: "/rotate[x | y | z] 180" (made a 180 ° rotation of the object relative to the respective axis). It can resize the object loaded in the Modeler. Syntax: "/resize 2" (double the size of the object) or "/resize 0.5 1 0.5" (reduced by half the size of the object on the axes X and Z). Change the size of lines used for rendering wireframe, expressed in pixels. It will make a mirror of the object loaded on the axis Z. It allows for the size of the object loaded in the Modeler. The result of the order displayed in the console. This displays the path of camera you want. It can easily see a path camera on a model. If you want a Windows version, ask for it! Or maybe even contribute it?